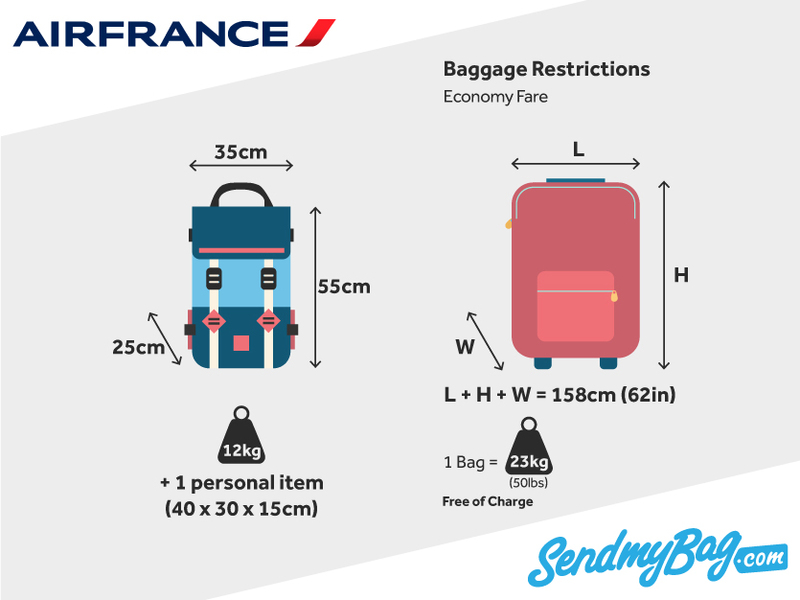 Check Air France baggage size restrictions and fees before you travel. Why not send your luggage to your destination with Send My Bag and give yourself the luxury of a luggage-free journey, while having as much of your luggage as you like available to you when you arrive? Just have your bags picked up before you leave, and delivered to your hotel or new home - as long as there is someone there to receive them. This is a great option for people moving abroad or international students studying in other countries. Get your free quote now. ‘Economy’: 1 bag with dimensions of 21.7 x 13.8 x 9.9 in/ 55 x 35 x 25 cm, plus a personal item measuring 16 x 12 x 6 in/ 40 x 30 x 15 cm. The total weight must not exceed 26.4 lbs/ 12 kg. Long-haul ‘Premium Economy’, all ‘Business’ and all ‘La Première’: two items of hand luggage, plus a personal item. The weight of all items must not exceed 39.7 lbs/ 18 kg. ‘Economy’: 1 x 50.7 lbs free of charge. ‘Premium Economy’: 2 x 50.7 lbs. ‘Business’: 2 x 70.5 lbs. ‘La Première’: 3 x 70.5 lbs. Dimensions of each item must not exceed 62 in (length+width+depth). If travelling on a 'Light' or 'Basic' fare, hold baggage must be paid for, with prices starting at 25 € online and 40 € at the airport. Prices are higher on long-haul routes. If bags exceed 62 in or the baggage allowance provided in the fare travelled on, an extra fee will be charged at the airport. This varies according to the route travelled. No item must exceed 70.5 lbs. Children with their own seat are allocated the same baggage allowance as adults. Infants travelling on an adult’s lap are allowed a hand luggage item weighing less than 26.4 lbs with dimensions that do not exceed 21.7 x 13.8 x 9.9 in., plus an additional baggage item up to 22 lbs (unless travelling on a ‘Light/ Basic’ ticket). A collapsible pushchair and car seat can also be transported in the hold. Smaller sports equipment under 50.7 lbs and under 118 in. can be transported in the hold, and are considered as standard luggage. Other items require prior permission from customer service. Bicycles are not considered as standard luggage and incur an additional charge between 40 € and 100 €, depending on the route travelled. Musical instruments can be transported as hand baggage if an additional seat is purchased. The weight per seat must not exceed 101 lbs. Prior approval from customer service is required. Or, instruments can be checked into the hold after paying an additional fee. Looking for Air France sized hand luggage?